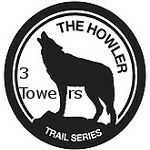 This is a tremendous route, climbing the 15 highest Welsh mountains. 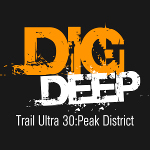 The terrain is very rough for long sections, and a lot of it is at high altitude. The navigation is often not easy, particularly when you’re in cloud. 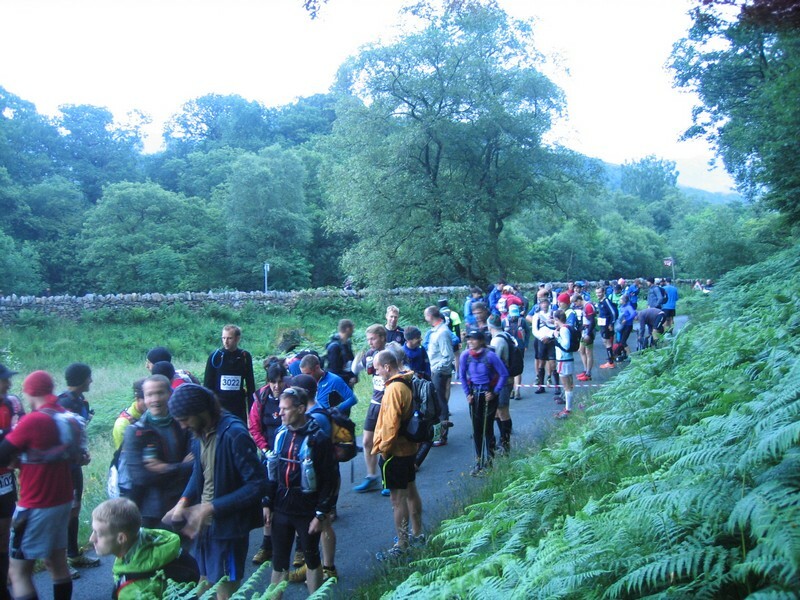 This year all the runners were in cloud for hours: there wasn’t much wind, but visibility was pretty poor, and in the early afternoon the rain set in, making the rocks slippery whetever your footwear, and making it all too easy to go astray. 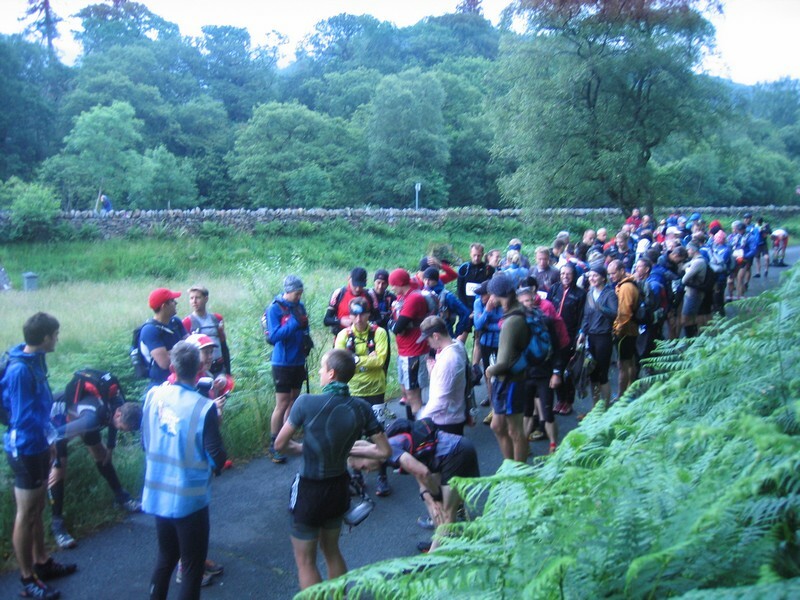 Over 100 runners entered, but only 65 made it to the end. Many got timed out after getting lost for too long, others found the going just too hard. The winner’s time was astonishing given the conditions. Michael Clifford finished in a time of 8:19, with Jayson Cavill 20 minutes behind him. Third place went to Chris Baynham-Hughes, a friend of mine from Helsby Running Club, in 9:11. 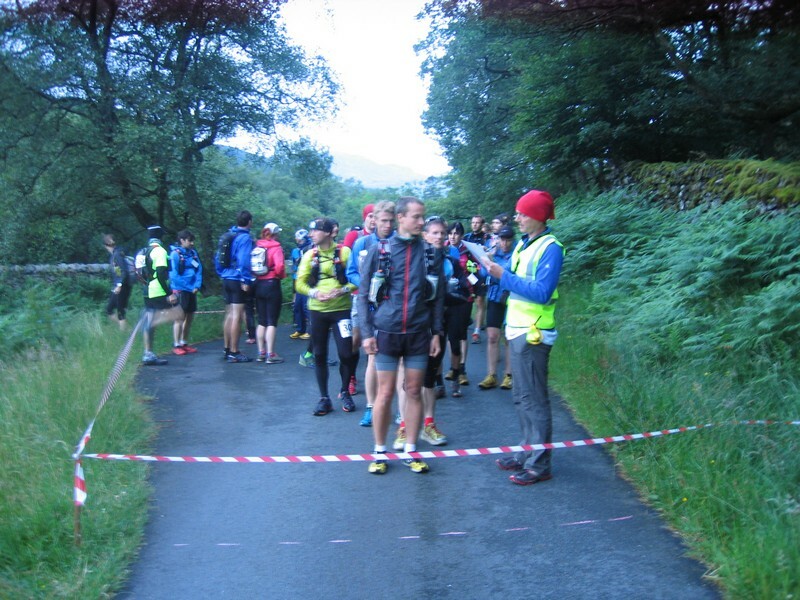 First woman home was Liz Barker in 10:29, with Claire Maxted, editor of Trail Running magazine, second in 12:36. Hats off to all of them. We mere mortals were happy just to finish! 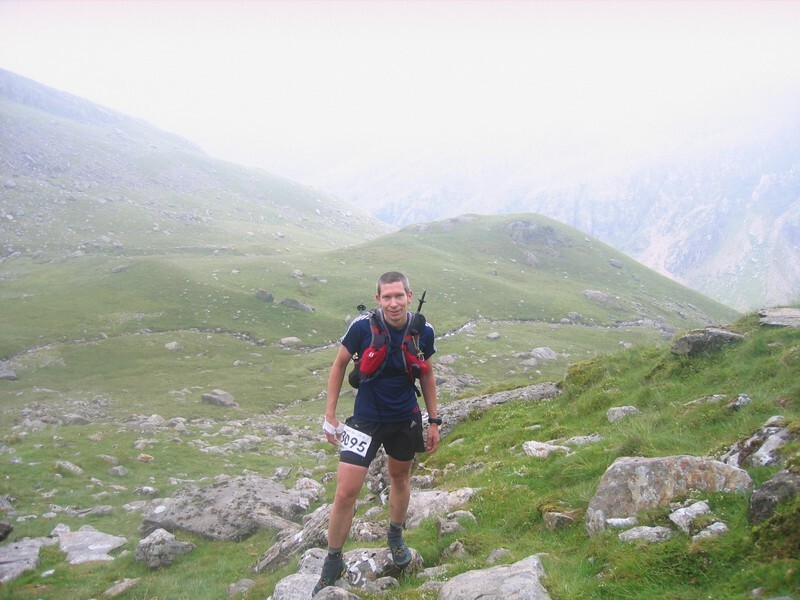 Nigel Aston finished in 20th position in 11:30, so his Runfurther Grand Slam attempt is still going strong. He’s written another great race report, which you can find here. Note that his photos weren’t taken on the day: we didn’t get views like those on Saturday! Emma David found Crib Goch a bit intimidating, as did a lot of people, but she finished well and her Slam bid is still on too. The updated Runfurther Championship leaderboard is here, and the race results are here. The Runfurther standings didn’t change much – it’ll be the next race that makes the big difference, the Long Tour of Bradwell on the 9th of August. Ned Lammas of Evesham Vale RC has moved well up the rankings with his 3rd counter, but probably can’t catch Nigel Aston unless he runs at least two more races. Lee Knight has moved up as well, and has more chance of overtaking Nigel, but since he hasn’t joined Runfurther he’s not eligible to win anything. If anyone’s in touch with Lee, could you please try to persuade him to fill in a Runfurther membership form? There are also some excellent photos on Andy Milton’s Flickr site. 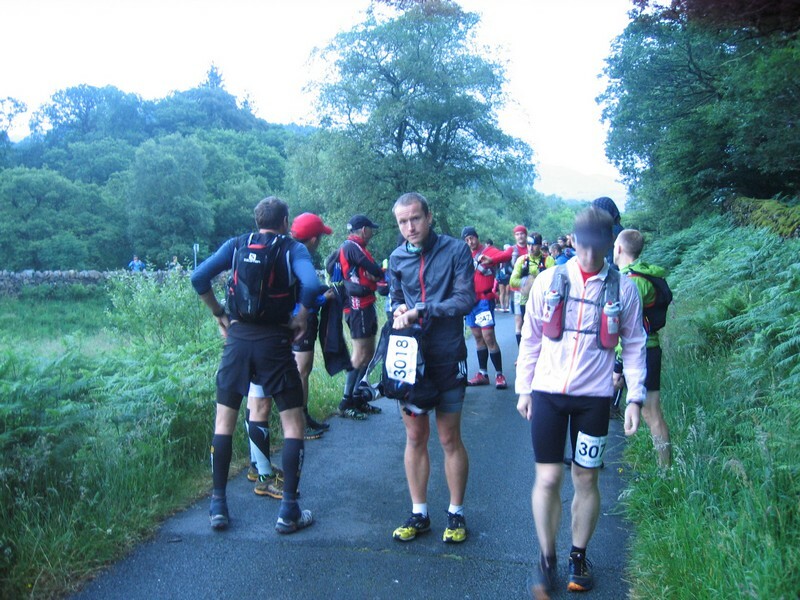 I suppose that doesn’t sound a big deal, but there are races and then there are mountain ultras. 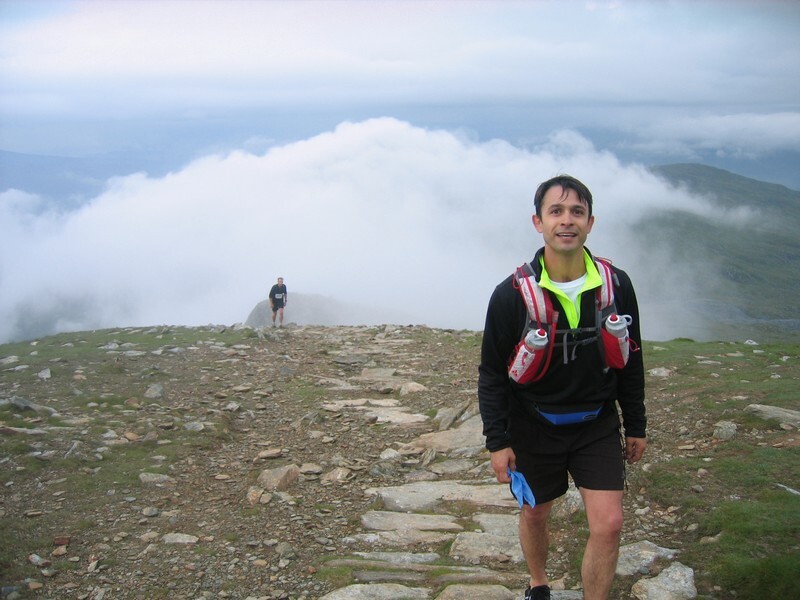 The V3K is about the same in climbing and in distance as half a Bob Graham Round, and the ground covered is significantly more difficult than on the BG. It doesn’t make sense to try to run something like this without plenty of training. When I entered the race I was fit enough to do it. Then in January I suffered a stress fracture in my shin, which meant no running at all until June. 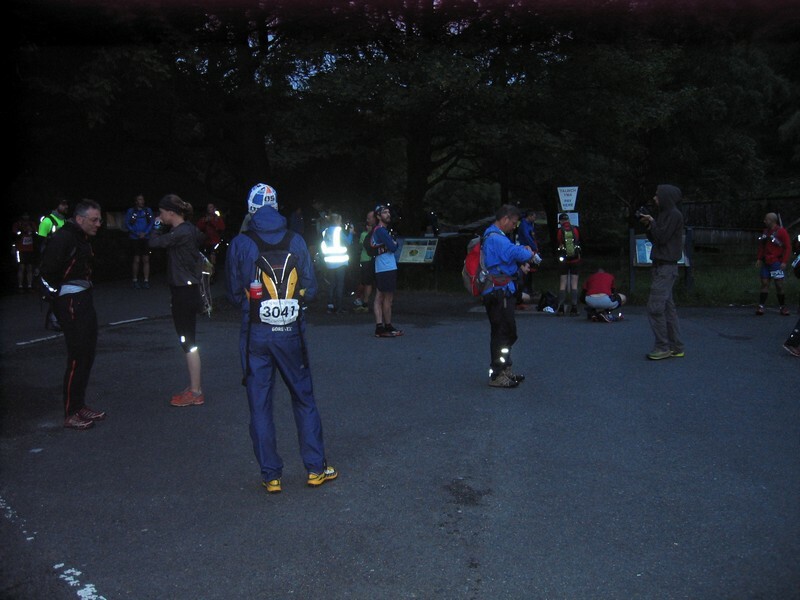 So four weeks later I was lined up with 100 other runners and a million midges at 5am in Nantgwynant at the bottom of the Watkin Path up Snowdon. The weather wasn’t too bad to start with, warm enough for t-shirt and shorts as we headed up the hill. 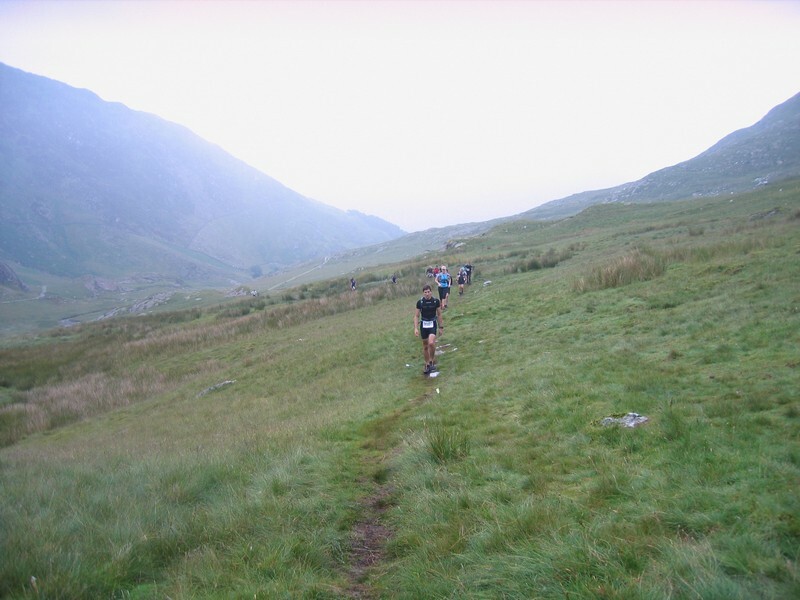 The race route starts up the Watkin Path then cuts up west to follow Snowdon’s south ridge, which is a fun way up the mountain, rocks but on a path, and not too hard. In fact it was the easiest bit of the day really. I chatted to a few people on the way, Claire Maxted being one of them. Soon after we reached the ridge we were into the cloud, and that’s where we stayed for much of the day. All straighforward stuff up Snowdon, and then Garnedd Ugain. 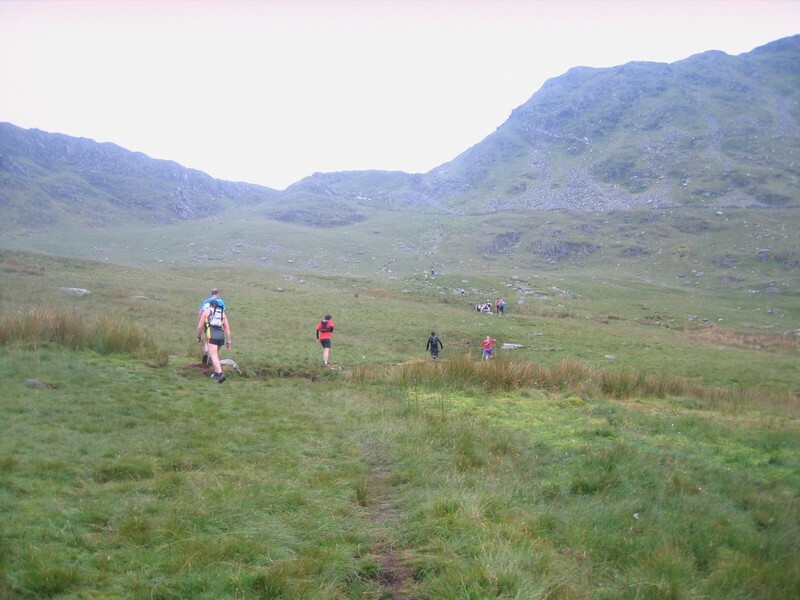 Last year it was a bit too windy for safety on Crib Goch, so the race followed an easier alternative down to Nant Peris. Not this time. It’s 20 years or more since I was last on Crib Goch, and I don’t think I’ve ever been up there in poor visibility before. 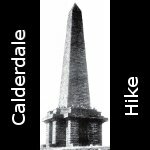 It’s a great ridge for an adventurous walker, but it’s not so good if you’re in a hurry, particularly if you haven’t recced it. Still, at least we couldn’t see the full extent of the drops beneath us as we tottered and clambered our way along and around the sharp rock ridge. It took forever to reach the summit, and then there’s a tricky bit of routefinding to get off the north ridge and down to the valley. Luckily for me I fell in with Andy Truswell (no. 3095 – see photo) who’d walked it a number of times before, and he led the way down to the road – thanks Andy! Down to the Nant Peris checkpoint for a drink of water and a toilet stop, then the second of the three 3000-foot climbs, an unremitting slog up to Elidir Fawr. This really was torture, and my back was starting to ache. That was the end of trying to take photos and the start of the mission to get to the end of the race. I followed a line of my fellow runners as we shuffled our way up. The next bit, from the top of Elidir Fawr, over Y Garn and down to Llyn y Cwn is actually pretty good running for a lot of the way, but then comes what must be pretty much the hardest few miles of race route in Britain, or at least it felt that way to me. The Glyders. Just a nightmare. I set off up the steep scree gully from the llyn into the clag. 1000 feet of horrible loose stuff all the way to the top of Glyder Fawr. Then off to Glyder Fach, but before you get there there’s a huge boulder field, with all the rocks slippery, and all trace of a path disappears. Somehow you have to find the top of the mountain in cloud, and the top is a big plateau of difficult ground, with the top somewhere. I probably found it more quickly than most, as at least I had my compass out. There were lost souls all over the mountain shouting to each other for advice. And to add to the confusion, the control wasn’t at the top, but “somewhere near the Cantilever” according the the last marshal we’d passed. Well there were about 20 people around the top and the Cantilever looking for it at the same time I was, and none of us found it. Apparently not many people did all day, although it was there somewhere! No disqualifications resulted, or there’d have been a very short finishers list. So we all gave up and headed down yet another horrible loose steep gully. And so to the third of the 3000 foot climbs, up Pen yr Ole Wen. Now this really hurt. 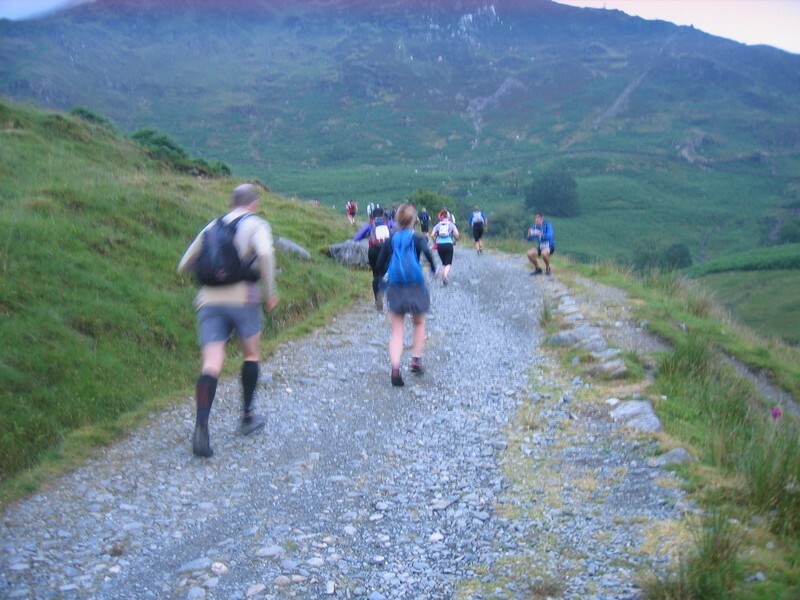 It wasn’t as monotonous as the Elidir Fawr path, as it varies in steepness, and scenery, but I no longer had anything much in my legs, and my back was screaming with every step. Still, only thinking one step at a time works wonders when I’m in that state, and by trying not to think about what I was doing, eventually I got to the top, and really the end of the difficult ground. OK there were a few stony stretches still to come, but there’s little climbing from this point on, and it just keeps getting easier as you go along. Unfortunately it was cold and raining as well, and of course the route stays high for miles and miles across the Carnedds. Carnedd Dafydd came and went, and then I was wondering how I’d spot where to leave the path and contour round to find Yr Elen, when I couldn’t see more than 20 yards in any direction. I was very thankful there was a marshal stationed there to tell me and give my the bearing to take. I headed off across the pathless mountainside, checking my compass from time to time, thinking my chances of actually hitting the peak weren’t really that good. I underestimated the time and distance to get there, so stopped too early at a small ridge, thinking it was the main ridge to Yr Elen, and started getting more confused, at which point Rob Balogh turned up. Unfortunately Rob was just as confused as I was, so we ended up just going back onto that 320 degree bearing and hoping for the best. Luckily it worked, and then Rob relied on my navigation all the way to the final descent into Rowen. The flog back up to Carnedd Llewellyn was hard work, but then it was back onto the clear ridge path and we were able to move a bit more easily, getting colder as we went. We reached the penultimate 3000 foot top, Carnedd Gwenllian, with some relief. One couple were just ahead of us, and they headed off north from the top and we never saw them again. The couple I’d descended Tryfan with left the top at the same time as Rob and I, and since they’d managed to turn their 1:25000 OS map inside out at the top, I thought I’d try to keep up with them, as my hands were too cold to attempt to do the same with my map in the rain. Although I didn’t know it until we chatted after the race, they were Ned Lammas and Sheila Barbour, Runfurther members from Evesham Vale RC. The four of us headed off northeast and soon found the little path that led us on to the last 3000-footer, Foel-fras. This had a manned checkpoint, or at least it did until we got there. He had been out there since the previous evening, and had just decided “sod this for a game of soldiers” and was heading down. On fresh legs and carrying a fetching red umbrella he scampered off down, and the four of us did our best to keep up with him, over Drum and down to the fence corner. Another runner passed the five of us, but none of us were in a state to catch him, or so I thought. At the fence corner at GR705708 the path turns right with the path and heads more steeply down, on good runnable grassy ground. This is where I can sometimes turn the gas on, even with tired legs, as long as there’s nothing but downhill to come until the end of the race. Having done the race last year I knew what was coming so I thought I’d give it a go. I hammered down the hill as fast as I could go given the state of my legs, not looking back, passing the runner who’d overtaken us earlier. I heard at least one runner behind me, but I’d no idea who or how many until I reached the Roman Road at the bottom. I looked round, and only Rob had come with me. The other three runners and the marshal were nowhere in sight. 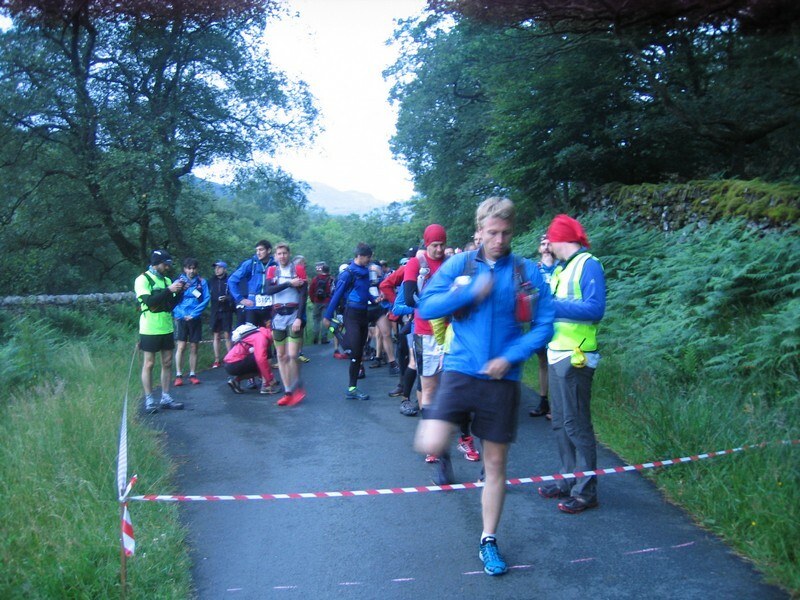 Rob and I kept up a good pace all the way to the final steep road section into Rowen, where we passed another runner, and I even left Rob behind as I pelted down the tarmac at unreasonable speed. Once round the field and I could collapse – I just love race finishes where I can run myself into the ground on a final downhill stretch, but this one beats them all, with five miles of runnable downhill to finish. My time was 13:33, and I was 36th of 65 finishers. I’ll settle for that, and I’ll probably be back next year, whether it’s in the Runfurther Championship or not. It’s a truly great race.